The Space 1999 Eagle Transporter Deluxe Accessory Pack features authentically detailed add-on parts to take your Space 1999 Eagle Transporter 1:48 Scale Model Kit (sold separately) to the next level. These machine-turned aluminum parts feature exquisite quality that can't be approached in injected styrene. The parts are precision tooled to exact in-scale detail and have been polished to a semi-gloss sheen. 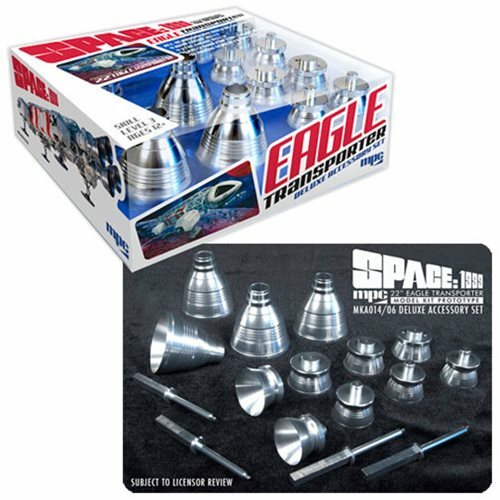 The Space 1999 Eagle Transporter Deluxe Accessory Pack includes replacement parts for the four primary landing gear struts, four vertical takeoff and landing engine bells, four VTOL lab pod engine bells and four main engine bells. Skill level 3, ages 12 and up.